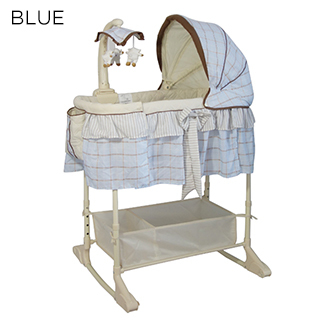 This adorable Infant Rocker Bassinet Cot by Bubs Gallery is the perfect sleeping option for your baby. It features MP3-ready musical mobile arm with adorable, rotating lambs, variable-speed vibration and a night light to keep baby sleeping soundly. The reaching in is easy since the canopy and mobile arm both can be moved out of the way. It also offers great storage so baby essentials are close by at all times. Gentle side-to-side rocking motion, a plush mattress and soft fabrics all help ensure your little one slumbers sweetly. 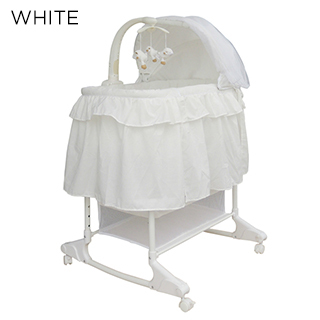 Parents will appreciate the variable height adjustment and the locking casters for easy transport. 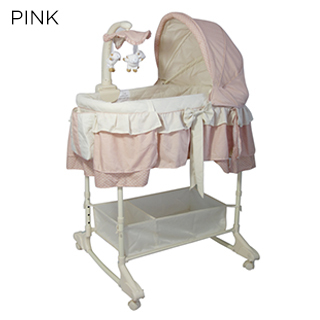 Suitable from birth up to 8kgs.